Through the centuries, sculpture in India has been a dominant expression of the people and their land. 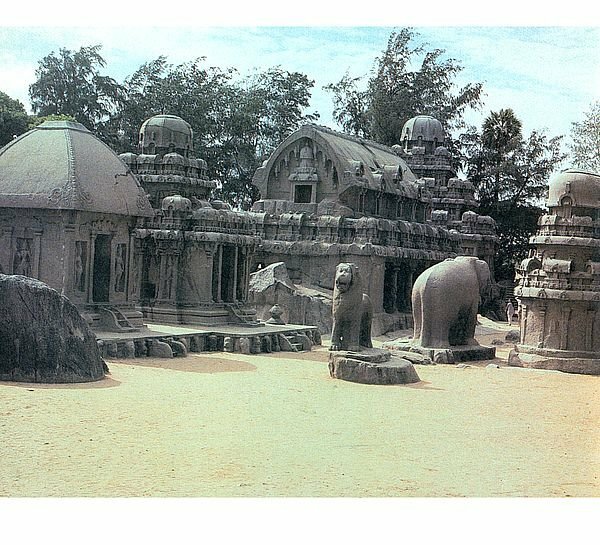 Today India provides a cultural continuity that has survived a long and diversified history, in which changes have occurred, old images and artistic expressions have been altered and new elements and influences have been absorbed, enriched and variegating the cultural strands without ever breaking them. 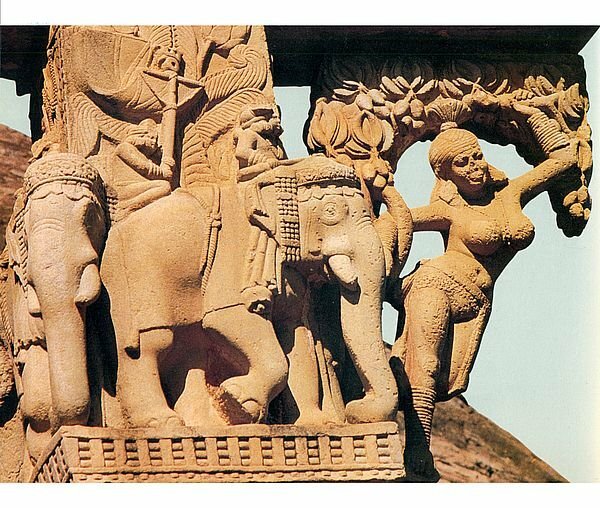 Sculpture, especially as an art form, was granted extensive patronage by the Indus valley Civilization, the Mauryas, the Satavahanas, the Sungas, the Kushans, the Guptas, the Chalukyas, the Rashtrakutas, the Pallavas, the Cholas, and still continues to thrive in contemporary India. Indian Sculpture is a richly illustrated book that reproduces some of the finest examples of Indian sculpture, with an extensive commentary on the importance of the art of carving, modeling and casting in the Indian civilization for over 4000 years. Dr. Grace Morley was the founder director of the National Museum, New Delhi. 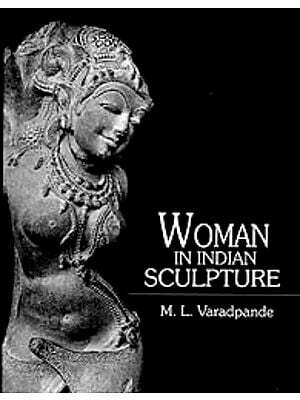 She was almost 80 when she wrote Indian Sculpture. Yet such was her eye for detail that she personally vetted each picture to ensure that the colours matched the original object. It was this meticulous attention to detail that makes this book a collector's piece. Under Dr. Grace Morley's care, the National Museum gained recognition as one of the most important institutions of its kind, not only in India but in Asia as well. Under her care, museums in India came to e recognized not only as abodes of cultural objects and research but also as disseminators of knowledge. DN DUBE is a highly acclaimed photographer who has authored several books. Gracious Grace, ripe, rich and mellow is no longer with us and yet her presence permeates the halls and corridors of museums and institutions throughout India, Southeast Asia and the Far East. Museums in the United States of America, Europe and Mexico also carry the imprint of her life's work. For me, Grace was friend, guide and philosopher, confidante, mentor and exacting master from the moment she arrived in India. Gentle as she was, Grace was nevertheless a symbol of flinty inner courage; a visionary who could concretize her dreams through unmatched precision. My memory travels far into the past. It seems only yesterday, though it was almost five decades ago, that I visited the Museum of Modern Art, San Francisco. An exhibition of the latest works of Henri Matisse sprawled over the spacious walls of the museum; its gray and brilliant blues left a deep impression on me. Visiting this museum was a great change from my many months of wandering around England's Victoria & Albert, the Metropolitan in New York and the Detroit Museum. The idea of space and light in a museum had never occurred to me until I entered the museum in San Francisco. It aroused in me an insatiable hunger for visiting museums of modern art in Europe, especially the Museum of Modern Art in Paris. I asked many which was the best and in reply came only one answer: San Francisco. The museum and its galleries were the work of a lady named Dr Grace Morley. She was known for her imagination and her exacting standards; an extraordinary scholar, she was said to be thorough, but inaccessible, and in short, the prototype of the professionally competent woman, much admired and a trifle dreaded. While the impression was strong and lasting in the intervening years, it receded into the grooves of my memory. Many years had elapsed. Moti Chandra had come and gone, others who had followed could not visualize a truly National Museum for India. An international search for a suitable director resulted in the fortuitous circumstance of Dr Morley's arriving in India after years of valuable work for UNESCO in Paris, Mexico and elsewhere. One fine morning I met her and then the memories of the visit to the Museum of Modern Art in San Francisco and its director's reputation were reawakened. I had heard from friends she was unapproachable, aloof and an exacting taskmaster. As I now sat and heard her speak with a senior colleague, I wondered whether this was the same person. Here was a kind and gracious human being, who appeared generous but unsure of the nature of the task which lay before her in this strange, bewildering land. Many doubts were raised, in public and in private. How would a non-Indian, a specialist in modern art or Mexican art be able to guide the destinies of a museum of Indian ancient and medieval art? Would she not be better suited to head the National Gallery of Modem Art? These and many other rumblings continued in Delhi circles, until one by one, each doubt and voice of skepticism was silenced and the National Museum acquired a character, a body and shape which in no small measure is the gift of Grace Morley to India. Years of arrears of accessions were cleared, photo index-cards introduced, cataloguing and documentation on scientific lines begun, conservation work launched and display galleries transformed beyond recognition in the course of two or three years. Her international contacts with Paris, Mexico and Rome brought in specialists of all aspects of museology. There was Plenderlieth from Rome, others from Paris, the United States and Mexico. Her great ambition was to put India with its vast and valuable art treasures on the world map. Assiduously she trained many younger colleagues, not only of the National Museum but from practically all other museums of India, in techniques of conservation, cataloguing, documentation and display. The fact that today India can be proud of an entire generation of competent museologists is to a large extent the result of Grace's single-handed initiative, drive and tenacity. Throughout she was as anxious to build institutions as to foster the growth of human resources, each time identifying with uncanny discernment the specific potential and then presenting opportunities for both challenge and eventual recognition. It was clear that Grace was a museum person first and last, and thus the specific areas of ancient or modem art, ethnology or science, textiles or jewellery were only a matter of responding to particular needs rather than just being a subject specialist in the field. Having watched her in operation emboldened me to request her to present two exhibitions on the occasion of the XXVlth International Congress of Orientalists held in India in January 1964. One of them was particularly exacting. An exhibition of Indian manuscripts for the august body of Oriental scholars from all parts of the world had to be presented. As the first session of this conference ever held east of Suez, this was a challenging organizational task. Grace helped and guided in every detail but most of all in the exhibition. The catalogue was a difficult matter. I watched her guide and direct its preparation and publication. She was both tireless and exacting, and I remember clearly the manner in which she brought enthusiasm and hope at moments when others felt a great dejection and a sense of hopelessness of achieving the targets. Soon after this I had my really intense orientation under her stewardship. The Teen Murti House was to be converted into the Nehru Museum, innumerable polyvalent skills were required to make a home into a national museum. Although I was not her formal student, in six weeks she transformed me into a pupil, or may I say a disciple, and I have so remained. Her sense of detail, her anticipation of problems, her ability to chalk out plans was as impressive as it was educative. Above all, her zeal and her energy and stamina put all of us, years her juniors in age, to shame, utter shame. For this experience and the training imbibed, I am beholden. Since then, there were other such valuable occasions, too numerous to be recounted. Each provided an experience to learn and to receive from her, both in the context of the National Museum and elsewhere. Throughout, I was staggered by her capacity for identifying herself wholly with an institution or a human being's welfare, and striving in all possible ways to find solutions. Such a capability is given only to a selfless person: Grace had it in ample measure. Understandably, she earned the appellation of 'Mataji' from many of her Indian sons and daughters. A discerning student of Western art and music, she was an avid reader and most knowledgeable in her response to beauties of Indian architecture, sculpture, painting, music and dance. The Kashmiri shawl was an old love of hers, which the Indian experience rekindled and extended to textiles in general. She was perhaps the stoutest spokesperson for the collections of the Bharat Kala Bhavan and Calico Museum. Her impeccable taste in texture, design and colour was evident in her choice of materials and fabrics-in furnishing and garments-both in the house and in the museum. For me, all this and her enthusiasm for the heritage of Southeast Asia (where I have had the opportunity to be her travelling companion) was an enriching, eye-opening experience. I remember the delight on her face watching the Ramayana Panels in Prambanan, Indonesia, and her enthusiastic and sensitive response to the arts of Bali. She was responsible for guiding the destinies of the National Museum, Thailand, and the conservation work at Pagan, Burma. Everywhere she earned the reputation of a fairy whose magic wand would find solutions. But those solutions were the results of perseverance, tenacity and ceaseless effort for the cause of the preservation of the cultural heritage of South Asia. She was committed to presenting it before the international community of museums. Her contributions in creating channels of communication amongst professionals of the area will have far-reaching effects in years to come. Grace had many other passions. The field of scientific conservation was close to her heart and I watched her stress the need for a separate institution with a gentle but firm tenacity. Her inspiration and work ultimately led to the foundation of a separate National Conservation Laboratory for Cultural Property. She was equally passionate about science museums. She travelled far and wide in the interior to help establish small science museums. The Birla Science Museum in Kolkata, the Visesvaraya Industrial and Technological Museum in Bangalore, the Science Museum in Mumbai are deeply indebted to her guidance. Natural history was another love. She nurtured the museums of natural history like a mother. Today, museums of natural history have become institutions in their own right. This too, in no small measure was Grace's contribution. She also dreamed of a major museum of war and peace, of implements, armoury and weaponry, and perhaps this will also become a reality. Grace had another accomplishment for which many Indian and Asian scholars are indebted to her. She was a meticulous and thorough editor, who took pains to peruse the writings of many art historians. Her keen eye identified every turn of phrase, each punctuation mark, and proofreading error. She was always able to retain the flavour of the original style. Above all, Grace was a full human being, generous and civilized, who identified herself with the complexities of this large continent and its plural cultures. She felt intensely and sincerely about causes and was deeply committed to the wealth of Asian materials. One may not be a believer in rebirth, but in her case it really did seem that perhaps in some previous birth she belonged to this part of the world. Spiritually and emotionally, she was Indian and Asian in a manner that can have little rational explanation. It was no accident that she had chosen to make India her home beyond the call of her vocation. In January 1984 Grace visited Kolkata and delivered an unforgettable address on Museums and Environmental Education. Soon after a brief illness, she left us at the age of 84. Friends from all over the world, her international family, mourned her passing. Appropriately, her friends decided to cremate her and to immerse the ashes in the water of the Ganga. Museum directors, art historians, scholars-all paid homage to the urn in that house of art: Bharat Kala Bhavan, Varanasi, before the ashes were immersed midstream. This was but right for Varanasi had been home to her in more ways than one. Here she had shared her deepest thoughts with the founder of the Bharat Kala Bhavan, that great scholar savant Rai Krishnadasa, whose ashes had been immersed in the same timeless river. A picture book on sculpture, the technical resources of contemporary photography notwithstanding, suffers inevitably from its being confined to a flat surface. The textures and colours of the materials, captured as accurately as the modern camera and skill in lighting permit, compensate only to a limited degree for the missing dimension. The essential quality of sculpture, whether in the full round in monumental or more modest scale, or in the high or low relief of friezes and tablets of different periods and styles, lies in its plastic form, which can only be suggested in photographs and illustrations. 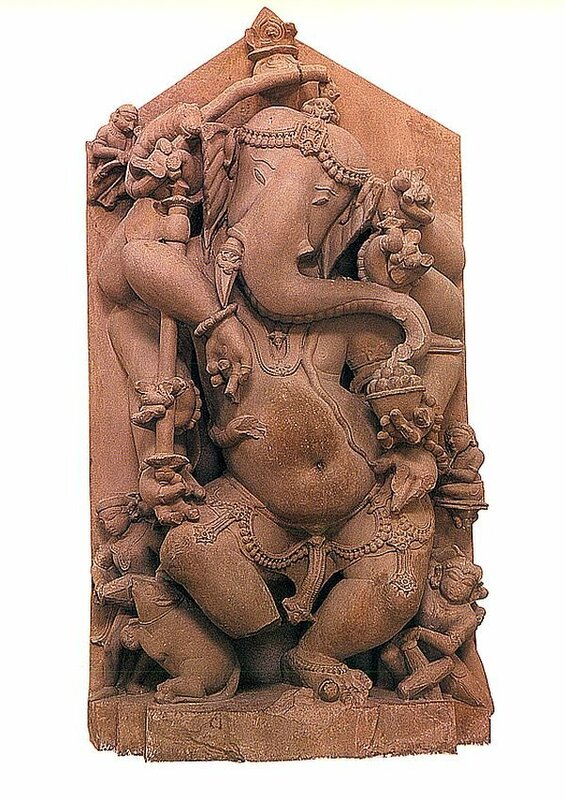 The justification for the present effort, which reproduces selected examples of Indian sculpture, is the importance that the art of carving, modelling and casting has held in Indian civilization for more than 4000 years. India provides today the best example of a cultural continuity that has survived a long and diversified history, in which changes have occurred, old images of life have been altered and new elements and influences have been absorbed, enriching and variegating the cultural strands, without, however, breaking them. Throughout the centuries, sculpture in India has been a dominant expression of the people and their land. Even though the nation has made noteworthy attempts to adapt itself to the modern world the majority of the population still lives in villages. Mainly agriculturists, they still follow ancient patterns of culture, including devotion to images representing the visual and tangible aspects of religion. Sculptors continue to fashion these images which still serve the majority of the people in temples, in processions for religious festivals, in shrines, in their homes and, likewise, in the humble form of terracotta as votive offerings as well as playthings. This picture book is a survey, based on texts of archaeologists and art historians as well as a personal response to sculptural masterpieces, especially those in museums. It makes no claim to fresh discovery. It is intended simply as a handbook for visitors such as a museum might print on its collections to call attention to certain outstanding works representing different periods and localities and, therefore, styles. It is an effort at popularization, in the good sense of making known widely, Indian sculpture of quality. Its purpose is sharing admiration and enjoyment by agreeable illustrations, providing general information regarding background and subject matter, and highlighting significant details through brief comments. The majority of the masterpieces here are works inspired by religion and have been selected for quality. Though deprived of their original setting of a temple or shrine, most being on exhibition in museums, they can be examined closely and appreciated primarily as works of art. For those who are not of the faiths represented, it is the quality of the artist's realization of the established image that is a sure guide to understanding and appreciation. For those whose beliefs the sculptures interpret the emphasis on quality, which they likewise represent, has probably no essential significance. Yet here is the proof that the artists who created them, according to clearly defined rules, in the accepted idioms of a period, a place and its style, devoted their creative talents, to realizing the figures and symbols according to the highest standards of which they were capable. That effort at perfection was initially an act of worship. This book attempts to capture that perfection, as well as India's cultural continuity in stone, metal, wood and terracotta that 4000 years of sculpture in India represent. I would like to thank those museums whose members cooperated generously with the publisher in facilitating photography for the book. Credits appear in the captions. The National Museum, New Delhi, the Indian Museum, Kolkata the State Museum, Lucknow, the Archaeological Museum, Mathura, and the Archaeological Survey of India's site museums, at Khajuraho, Sarnath and Varanasi, merit individual mention. The Archaeological Survey likewise assisted in photographing some monuments in its charge. Finally, it is a pleasure to record here the appreciation of the publisher's patience in striving for the excellence desired by all concerned. India has maintained cultural continuity for more than two thousand years. Natural calamities, internecine wars, foreign invasions and conquests, including long occupations by alien rulers, have disrupted or even destroyed other ancient cultures. The inhabitants of India have faced such events without loss of identity. In some instances indeed they have reacted with vigour and even benefited from them. This continuity, never static which remained deeply rooted in its origins despite changes, is nowhere more clearly demonstrated than in the uninterrupted evolution of the art of sculpture in India. Some stone sculptures, fragments and perhaps a large figure or two, can be dated to the Mauryan period, which began with the rule of Chandragupta Maurya around 322 BC. From this time it can be said that the history of India began. Not only do inscriptions survive, but an account of the Mauryan Empire and of its capital Pataliputra, near modern Patna, was written by the Greek ambassador to Chandragupta's court, Megasthenes, and had wide currency in the ancient world. He represented Seleucus Nicator, a general of Alexander of Macedonia, left behind to govern a portion of the invader's conquest. The first monumental sculpture of India was commissioned by Chandragupta Maurya's grandson, Ashoka (c. 272-232 BC), to crown with animal capitals the pillars inscribed with his edicts. It must not be overlooked, however, that long before Ashoka ruled over his great empire an ancient, highly developed urban civilization, had emerged on the subcontinent. This was the Harappan or Indus Valley culture, named after the first site discovered, or after the mighty river on which stood its great city, Mohenjodaro. This city, like others of the culture, was constructed of baked bricks; had paved streets laid out in an orderly fashion, wells and drainage systems. It was defended by a fortified citadel dominating the quarters of houses and shops. Contemporary with civilizations in Egypt and Mesopotamia, the Indus Valley culture flourished for approximately a thousand years, (c. 2500-1500 Be), and then disappeared and was forgotten until the discovery of its ruins at Harappa in 1921. Mohenjodaro is the largest city yet discovered but smaller settlements were distributed over a large area, stretching for some twelve hundred kilometres at least, from Harappa in the north to Lothal (Gujarat) in the south. No monumental sculptures or architectural decorations belonging to this culture have been found, though a few small stone sculptures of heads and torsos and still smaller bronze castings of figures and animals have been discovered. The exceptional skill of the sculptors is evident in the exquisitely carved steatite seals bearing the likeness of bulls and other animals. 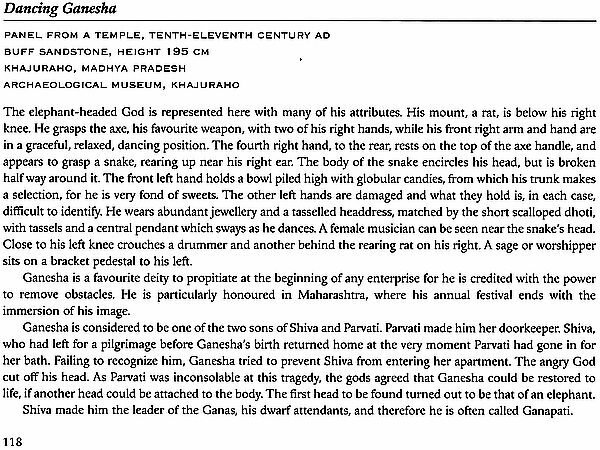 Other examples are the figurines bearing symbols that are yet to be deciphered. Archaeological evidence fails to explain the decline of the Indus Valley culture. For about a thousand years after it, until the Mauryan dynasty came to power, no civilization of equivalent attainment appeared on the subcontinent. Evidence of settlements, of movements of populations, of patterns of culture during this long period, is still being documented as scientific excavations continue. During this time the Aryans established their religious and cultural influence in northern India. Whether the Aryans were invaders or their civilization was an indigenous development is still not clear. It was long supposed that they came from the north and that they were part of migrating groups which also entered Europe, and where most modern European languages seem to derive from the same Indo-European source as Sanskrit. In any case, though not documented by archaeology as yet, and their origin still a mystery, the influence of the Aryans on the subcontinent was deep and lasting. They had an oral literature, preserved by an elaborate system of memorizing, of which the Rig Veda, a collection of hymns, is the most ancient, the most sacred and the most important part. Their language evolved into Sanskrit, the classical language of ancient India, and still that of the Hindu religion. The Aryans had a highly organized society, ruled by a warrior class and served by priests, whose knowledge of the sacred oral literature and of rituals and ceremonies, as well as of sacrifices, which ensured the well- being of the people and made them powerful. Midway during this period occurred two events destined to have a deep influence on human history. The leaders of two movements, which were to become important religions, were born to the rulers of small states in north India. They were Siddhartha of the Sakyas, who became the Buddha (c. 624-544 BC), and established Buddhism and Vardhamana of the Jhatikas, the Mahavira (Great Hero) (c. 599-527 BC), who established the Jain religion. Both of them renounced their aristocratic way of life to attain spiritual 'Enlightenment' by the practice of austerities. Both became teachers. They advocated high principles of conduct to their followers and gained devoted disciples to whom they preached, teaching them disciplines which would lead to eventual release from cycles of rebirth. During their own lives they won large followings in north India. Both religions spread, in course of time, to other parts of the subcontinent as well. Eventually Buddhism was to be carried to Central Asia and thence to extend eastward to China, Korea and Japan. To win to the faith the ruler of Ceylon (modern Sri Lanka) and his subjects, Ashoka sent a relative there with a cutting of the Bodhi tree under which the Buddha had attained 'Enlightenment'. From Ceylon Buddhism eventually reached South East Asia, and it is the dominant religion of many countries in that region today. By contrast Jainism did not spread beyond India, but has remained an important minority religion up to the present. Buddhism ultimately declined in India and was absorbed into Hinduism, but elsewhere it evolved into different forms, including the distinctive Mahayana devotion practised in Tibet, Bhutan and Mongolia under reincarnated lamas, and Zen, familiar to the West as a Buddhist sect of Japan. This long period, from the Indus Valley civilization to the Mauryan Empire, offers almost nothing in sculpture. Unique so far is the group of four bronzes-a chariot with its driver, a bull, an elephant and a rhinoceros-excavated at Dhaimabad, Maharashtra, by the Archaeological Survey of India, now exhibited in the Chhatrapati Shivaji Museum, Mumbai. They are not sophisticated castings, but have the vigour of folk art. 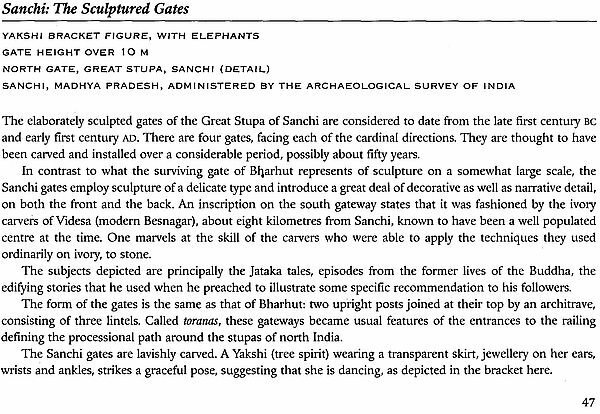 They are attributed to late Indus Valley influence and are thought to date (c. 1200 BC). Otherwise, only terracotta figurines, mostly female, some elaborately coiffured and bejewelled and of considerable elegance, but most crude, with features pinched or appliqued, and roughly modelled or cast bodies, probably dating from the sixth or fifth centuries BC, or later, represent the plastic art of this period. It is against this background of small- scale figures that the monumental inscribed pillars of Ashoka, crowned with animal capitals, appear as dramatic innovations. 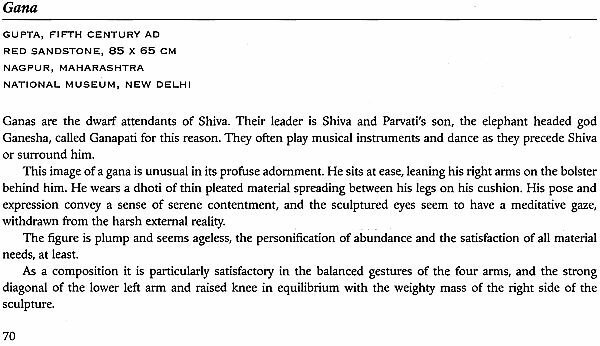 The predominant medium of creative expression in the sub-continent, since the days of Ashoka, seems to have been sculpture. Or it may be that substances commonly used for sculpture, stone, terracotta and metals, being relatively durable, have survived in climates destructive to more fragile materials. 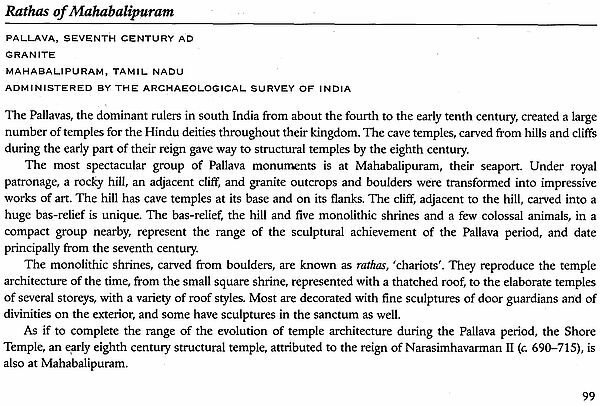 This undoubtedly accounts, to a considerable extent, for the amount of ancient sculpture preserved. 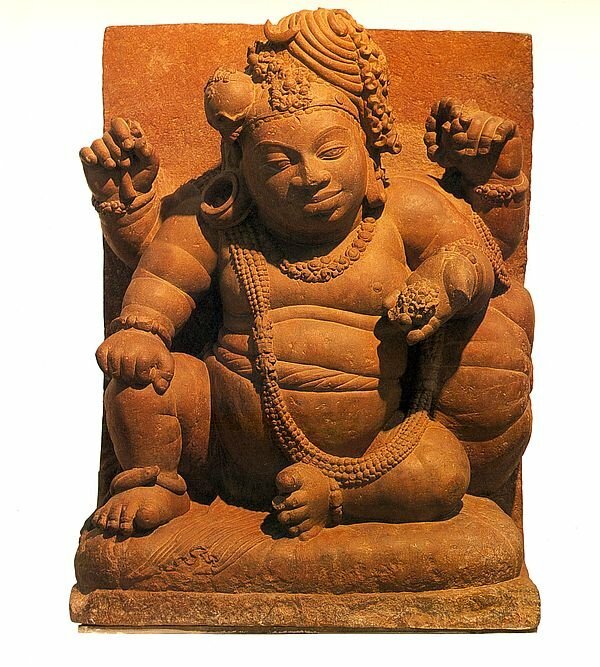 However, from the beginning of the present era, the production of sculpture increased steadily in India, resulting in a great quantity and variety of pieces principally inspired by the religions of India, as images for worship, or to illustrate episodes associated with them, or to adorn their settings. Certain centres stand out for the quality as well as for the quantity of this production.